Puzzles in which one has to find the mistake in pictures are very interesting observational puzzles. It is great test of one's visual abilities. In these puzzles mistake could be anywhere in the picture. The puzzle picture may contain some sentences written and then alphabets, set of letters or numbers with the one mistake in the full written text. One has to find this mistake in the given picture. Sometimes Mistake Puzzles may require one to find the mistake in the given visual picture in which on text is given. 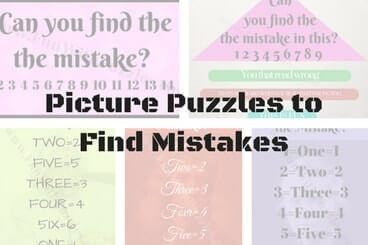 There are many different types of Finding the Mistake Puzzles on this website. Here is the list of the Mistake Puzzle Page. Do click on the links below to open the corresponding Puzzle page. So are you read to Find Mistake in the Pictures? Do you have the eagle Eye to observe the pictures carefully and then find the mistake? Lets check it with the following observation skill tests to find the mistake.